The Victorian Bulldog is a muscular and athletic breed of dog. Their stout limbs, wide nostrils, broad muzzle, rose or button ears and loose-hanging skin give them the typical look of the bulldog. The eyes of these dogs are set low and wide apart, and their canine teeth are large. Their wide chest, straight and muscular forelegs, broad shoulders, all added up to their stocky look. This loyal and trustworthy dog is said to be a ‘favorite to the elite classes’. Like other breeds of bulldogs, insist on a raw diet for your Victorian bulldog. However, a meat-only diet is not recommended since bones, stomachs, intestines were also a part of their primitive dietary habits. Also remember, amongst the dogs, especially bulldogs cannot tolerate excess of protein in their diet since this might give them hot spots. Other than meat, bones, and other animal parts, also serve them with raw eggs, fruits, semi-cooked vegetables, yogurt, etc. in order to ensure a balanced daily meal. The Victorian Bulldog responds well to simple obedience training. Being intelligent and interactive, they would relate well with their human masters and pick up training fast. However, they respond best if your training process is gentle. Be sure to give pack-leader training to your puppies well in advance. The hindquarters of the VB are little higher than and not as heavy as its foreparts. However, this does not destroy its well-contrived symmetry. 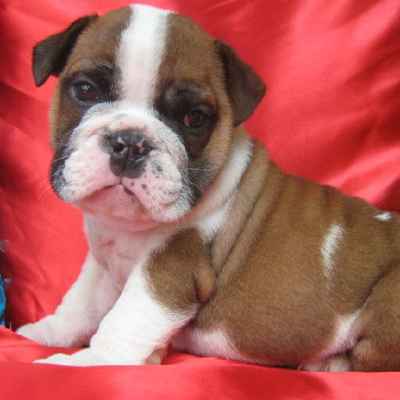 Typically, the Victorian Bulldog can have coats that are solid brindle, fallow, fawn, red, or white. This bulldog has an appearance similar to that of an English bulldog. However, the difference between the two is that, the Victorian Bulldog is larger by size.